A safe and efficient instrument decontamination workflow provides protection for patients and practice personnel alike. A steam sterilizer is a prerequisite for a reliable decontamination workflow in practice and clinic. With the European standard EN ISO 13060 came a new classification system for steam sterilizers and practice autoclaves, specifically classifying Class S and Class B sterilizers. Tailored to the needs of practices and clinics, MELAG provides devices of both classes while ensuring the highest level of quality and reliability. Worldwide sales of over 500.000 steam sterilizers are proof of the international success and appreciation of the MELAG product line. 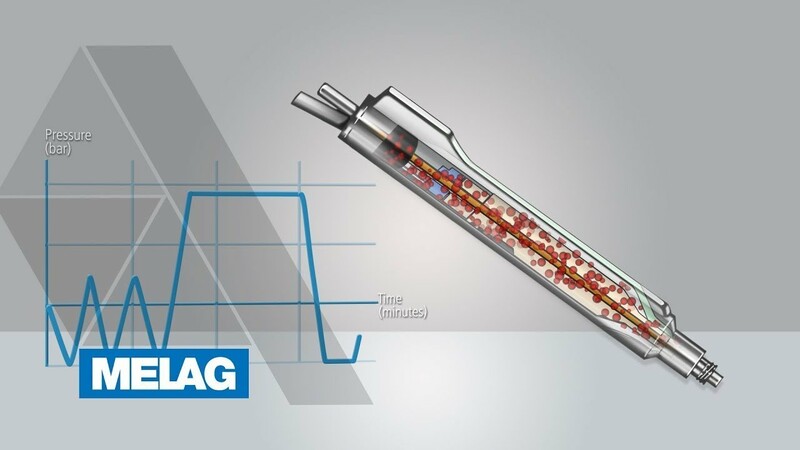 Since the founding of the company in 1951, MELAG established an impeccable worldwide reputation and has set new standards in instrument decontamination with the innovative solutions. Class B steam sterilizers of the Evolution series combine record sterilization times, energy-efficiency, intuitive operation and comprehensive documentation. Find out more about the advantages of this new generation of steam sterilizers. The tried-and-tested Class B autoclaves: compact, high-performing and reliable. The fractionated pre-vacuum of the Pro-Class series ensures short cycle times and complies with the highest requirements of EN 13060. Top-quality Class S autoclaves with many advantages: The versatile programs and documentation features of the high-performance Euroklav series ensure excellent results in the sterilization of single wrapped instruments. For maximum reliability and efficiency in a clinic and practice setting: Our innovative large steam sterilizers (100 and 200 L) facilitate the smooth running of operations in hospitals, outpatient clinics and surgical practices. Quick steam sterilization of handpieces and turbines in only 7 minutes: The MELAquick series is a reliable partner for all dental practices and clinics. Learn more about the efficient sterilization of transfer instruments. What is a steam sterilizer and autoclave? A sterilizer can achieve the destruction of all pathogenic organisms using heat, pressure or radiation. International hygiene guidelines recommend using autoclaves, which perform sterilization of medical devices and instruments with saturated steam. Steam sterilizers are defined as gas-tight sealable pressure vessels for the thermal treatment of materials requiring elevated temperature and pressure different from ambient air pressure. The temperature of the saturated steam in combination with the holding time ensures successful sterilization of medical instruments, textiles and other medical devices. The steam sterilization is usually performed at 134 degrees. Fractionated pre-vacuum is applied multiple times to evacuate air from the sterilization chamber ensuring the decontamination of complex hollow body instruments, such as endoscopes, dental hand pieces and ultrasonic suction cannulas. International hygiene guidelines recommend that instruments are wrapped and sealed after cleaning and disinfection and then sterilized - preferably with saturated steam. Packaging the instruments in sterilization pouches or in sterilization containers prevents recontamination of the instruments after the sterilization cycle. The European standard DIN EN ISO 13060 divides autoclaves into the classes B, S and N.
The pre-conditioning phase: The pre-conditioning phase comprises a conditioning and (as required) an evacuation phase. Steam is injected during the conditioning phase generating over-pressure in the sterilization chamber. The Class B or Class S steam sterilizer then evacuates the resulting air-steam mixture. This process is repeated in the autoclave up to three times. The air removal phase ensures that no air remains in the sterilization chamber and the inside of hollow body instruments. The heating phase: The continuous introduction of steam generates a pressure and temperature increase in the sterilization chamber. The sterilization phase: The sterilization phase starts as soon as the program-specific sterilization parameters have been achieved. Typically, the load is exposed to a set temperature of 134 degrees °C for a set holding time of 5.5 minutes. Heat or moisture-sensitive instruments and textiles can be sterilized using the Gentle-Program with a temperature of 121 °C for a holding time of min. 20.5 minutes. Pressure release phase:Pressure is released from the sterilization chamber after the holding time is over. Drying phase: Depending on what sterilization method is used, the instruments and packaging are dried using either vacuum drying or high-pressure drying. Ventilation: Upon completion of the sterilization program, autoclaves using Class B or Class S programs draw ambient air into the steam sterilizer chamber through the air filter, thus the sterilizer chamber is exhausted to atmospheric pressure. It is now possible to open the steam sterilizer door and remove the reprocessed instruments. MELAG Class S and Class B autoclaves provide the most reliable steam sterilization solution for all medical fields. The next section explains the differences between the two classes. Class B autoclaves enable the sterilization of all wrapped and unwrapped instruments, no matter their type and complexity. The fractionated vacuum reduces the air in the sterilization chamber through repeated evacuation and steam injection. This process permits the sterilization not only of solid and porous instruments, but also complex hollow body instruments with narrow lumen such as surgical hand pieces and endoscopes. A standardized helix test body can be used to check the successful sterilization, even of complex hollow instruments. Our Class B practice steam sterilizers use the same sophisticated technology as large hospital autoclaves in a CSSD. All MELAG Premium-Class, Pro-Class and Cliniclave autoclaves are fitted with a Class B program. The Class S steam sterilization ensures the decontamination of single and double wrapped instruments, porous products and small parts, solid and simple hollow body instruments, such as hinged instruments (scissors, clamps). The user manual of your Class S steam sterilizer provides a comprehensive explanation about the proper and intended use. Practices and clinics not using complex hollow body instruments are advised to choose a Class S steam sterilizer over a Class B steam sterilizer. The cost-efficient Class S autoclaves either use the method of gravity displacement or a simple fractionated pre-vacuum. MELAG Class S autoclaves of the Euroklav and MELAtronic series provide reliable and safe sterilization for practices and clinics using solid and simple hollow body instruments. The stand-alone autoclave gives you the opportunity to be flexible and location-independent. The only pre-condition is an electrical power outlet in your decontamination room. As there is no additional installation required to ensure the water supply, demineralized water is to be manually filled into the integrated water tank of the autoclave. MELAG stand-alone steam sterilizers are fitted with high-performance air-cooling of the membrane pump to guarantee the reliable use during non-stop operation. Autoclaves with a fixed water connection save both time and money through the automatic supply of high-quality demineralized water. These steam sterilizers require feed water and waste water connections. A small amount of tap water is reprocessed with a water treatment unit to be used for steam sterilization. The other fraction of tap water is used for effective cooling of the vacuum pump and other components. High-quality demineralized water is very important for decontaminating instruments in a medical or dental practice and clinic. Low water quality can result in deposits building up on the instruments and in the sterilization chamber. The combination of the MELAG autoclaves with a MELAdem water treatment unit ensures comprehensive instrument protection and value-retention of the steam sterilizer. The time-consuming acquisition and disposal of aqua dem canisters is not more than a distant memory. MELAG provides every practice and clinic with individual system solutions for the entire instrument decontamination process. An overview of the complementary water treatment units is available here. Which requirements are placed on the demineralized water for steam sterilization? The terms distilled water and demineralized water are often used interchangeably. Whilst distilled water requires reprocessing through evaporation and condensation, demineralized water refers to water, which does not contain minerals. However, the achieved water quality using the respective methods can be the same. Demineralized water is usually produced in water treatment units using ion exchange or reverse osmosis. The requirements placed on the demineralized water are defined in European standards DIN EN ISO 13060 and DIN 285. A reference on the labels of the aqua dem container provides reassurance about the suitability of the demineralized water for the sterilization process. Please fill the demineralized water in the integrated water tank of the stand-alone autoclave. The water quality is checked before every program start using conductivity measurement. With a water quality of 40 µS/cm, the steam sterilizer issues a warning; a malfunction message is issued if 60 µS/cm is exceeded. If the tank of the autoclave contains water of insufficient quality, the program start is disabled. The abbreviation “µS/cm” stands for micro-Siemens per centimetre. This value defines the electrical resistance of the solution between two flat or cylindrical electrodes separated by a fixed distance. Medical and dental practices or clinics are confident with MELAG autoclaves using an automatic feed water supply. We recommend the water treatment units of the MELAdem series for this purpose: The MELAdem 47 uses the reverse osmosis method while the MELAdem 40 and MELAdem 53 use the ion exchange method. Reprocessing the tap water produces optimal demineralized water with conductivity between 1 and 5 µS/cm. Which costs are due in the operation of autoclaves? International hygiene guidelines specify the performance of maintenance services to guarantee the reliable operation of the steam sterilizers. Only technicians with requisite training may be entrusted with performing this service task. Steam sterilizers and washer-disinfectors are usually equipped with maintenance counters, which issue a maintenance message after completing a specified number of cycles or time interval. Other manufacturers of autoclaves use different maintenance sets and spare parts. During the product development stage, MELAG places considerable value on sustainability, thus aiming to minimize the number of spare parts for later maintenance while also reducing service times. The most important maintenance task performed on MELAG products is the inspection of all relevant components ensuring the functionality of the device, as well as the replacement of wear parts. MELAG-trained technicians perform the maintenance measures quickly whilst seeking to minimize costs. The obvious advantage of using the MELAG system solution is that the maintenance can be performed quickly and most of the time in one sitting. However, the associated cost-savings are not achieved when setting up a multi-brand decontamination workflow that requires different service technicians to carry out inspection at different times of the year on different devices. MELAG offers a hassle-free, co-ordinated and cost-friendly alternative. In addition to maintenance costs, the consumption costs for energy and water drive up the cost of steam sterilization. MELAG engineers attach significant importance to achieving low consumption figures without a loss in quality. Additional costs can also result from unforeseen repairs of the autoclaves. MELAG stands for quality “Made in Germany”. Our entire product range is produced exclusively in Berlin. With over 160 R&D, IT and testing engineers, we strive daily to improve quality. MELAG products have developed a reputation for being reliable, user friendly and low maintenance. Taking into consideration all the costs incurred throughout the devices life span, the total cost of ownership of MELAG devices is significantly lower than that of their competitors, even those initially retailing at lower prices. How to load the steam sterilizer correctly? Successful sterilization requires correct cleaning and disinfection of the instruments. Please always comply with the reprocessing instructions from the instrument manufacturer. When performing instrument care, it is imperative not to use water-repellent care products or water-impermeable oils. Use only those care agents suitable for steam sterilization. Place sterilization packaging (foil and paper pouches) on the top trays. Except when sterilizing in combination with textiles: In this case, place them at the bottom. As far as possible, sterilization pouches should be placed in an upright position in the steam sterilizer. If you place the sterilization packaging directly on a tray, make sure that the film side faces upwards to prevent the development of water droplets. Das fraktionierte Vakuumverfahren von Klasse B Autoklaven ermöglicht auch die Sterilisation von Mehrfachverpackungen. Hierdurch können Sie Instrumente in zwei Folienbeutel oder in einem Folienbeutel und einem Sterilisierbehälter verpacken. Geschlossene Sterilisierbehälter, vorzugsweise aus Aluminium, müssen mindestens an einer Seite für den Dampfeinlass perforiert sein. Die MELAstore-Boxen und die Sterilisiercontainer von MELAG sichern optimale Sterilisations- und Trocknungsergebnisse. The fractionated vacuum used by Class B autoclaves also permits the sterilization of double wrapped instruments e.g. instruments wrapped in two pouches or in a pouch and a sterilization container. Closed sterilization containers (preferably made of aluminium) must be perforated on at least one side to permit steam injection. The MELAstore-Boxes and the MELAG sterilization containers ensure the best-possible sterilization and drying results. Are bacterial checks (spore tests) prescribed for practice autoclaves? Routine checks of the steam sterilizers are an important part of hygiene management in a practice and clinic. Steam sterilizers used to be inspected bi-annually by using biological indicators or after 400 sterilization cycles. This requirement was specified in an obsolete chapter of DIN 58946-6. The current European standard DIN EN ISO 17665-1 does not specify any requirements regarding the use of biological indicators. Biological indicators such as spore tests are not suitable for assessing the success of sterilization. The sterilization requires a longer holding time than required for the elimination of the biological indicators. Thus, we recommend the use of a suitable indicator system for checking the batch quality after sterilization: The sterilization outcome of hollow body instruments is subject to control with a helix test body. As a system provider, MELAG developed the helix test bodies MELAcontrol and MELAcontrol Pro to enable performing regular quality checks of the sterilized batches in Class B steam sterilizers. Both test bodies comply with the requirements of EN 867 – 5. Class S autoclaves can be checked with Class 5 indicators. Sterilizing more instruments faster and safer with Cliniclave 45. In MELAG, we have found a strong and reliable partner to help implement the highest hygiene standards, providing the best protection for patients and staff alike.